The following sketch of his life and teachings is compiled from a number of accounts, of varying credibility, by the early anti-Gnostic writers, and from the existing fragments of the Apophasis Megalê (“Great Announcement,” or “Great Exposition”) a Simonian document which was almost certainly written after Simon’s death but which purports to expound Simon’s true teachings. The only known fragments of this document were preserved by Hippolytus in his Philosophumena. Simon’s cosmology, as best as can be reconstructed, included the axiom that Fire (corresponding to the Orphic Phanês), is the first principle of all things. This Fire, like Phanês, is bisexual, having both sexes within itself. Its male aspect was hidden, and its female aspect was manifested in the name Silence (corresponding to the Orphic Nux). The Cosmos came into being from the unbegotten Fire through Silence by means of six aspects of the Fire – six “Roots” or “Powers,” in three male-female polarities or syzygies (from syn, “together” and zygos, “yoke”): Nous (Mind), also called Dynamis (Power), and Ennoia (Thought); Phonê (Voice) and Onoma (Name); Logismos (Reason) and Enthymêsis (Reflection or Plan). Simon’s disciples allegedly revered him as an incarnation of the “Great Power of God,” i.e. of Nous, or the Boundless Power. They believed that the Boundless Power, beholding the crimes of the angels, had descended into the lower regions where he appeared as a man, though he was not a man. They believed that he had revealed himself as the Father to the Samaritans, and as the Son (Jesus) to the Jews. As the Son he suffered a docetic passion, i.e., in appearance only, for a true manifestation of divinity cannot truly suffer or die. In his current form, he offered salvation to his followers from angelic tyranny through his divine knowledge (Gnôsis), the knowledge of the Male-Female Mother-Father whose divided essence pervades all Humanity. While teaching in the Phoenician city of Tyre, the divine Simon beheld a courtesan on the roof of a brothel. Her name was Helena, and he recognized her immediately as the current incarnation of Ennoia, His First Thought, the Holy Spirit, the Mother of All. She was the Lost Sheep, forced by her progeny the angels to wander through the centuries from vessel to vessel (including that of Helen of Troy), until she ended up at the brothel in Tyre. He purchased her from her master and she became his constant companion during his travels and teachings. Their reunion represented the beginning of the redemption of the world, and was the model for the process of salvation to Simon’s followers. In his wanderings with his disciples, Simon’s miracle-working and charisma allowed him to found a number of churches along the Palestinian-Syrian coastline from Caesaria (near the present day city of Hadera) to Antioch. However, he soon lost his churches to the more successful Peter, who followed in his footsteps. 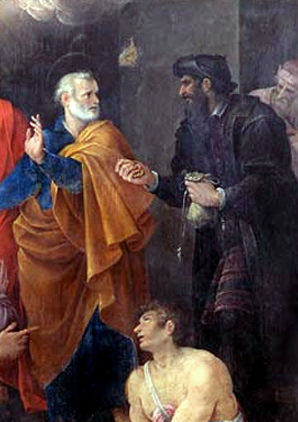 According to one rather questionable legend (which is nevertheless taken at face value by the Roman Catholic Church), Simon eventually ended up in Rome where he was defeated by the apostle Peter in magical combat. Simon allegedly flew into the air to demonstrate his power to the Emperor Nero, but Peter canceled his spell and brought him crashing to the ground. According to a more plausible account, he died peacefully among his followers in Antioch. Simonian churches persisted until the time of Constantine, mainly in Syria, Phrygia, Egypt and Rome. Simon’s followers apparently divided themselves into two schools, one in Syria and one in Alexandria. The Syrian sect seems to have tended towards libertinism, engaged in magical practices, and worshipped Simon and Helena as gods in the traditional pagan sense, associating them with other notable male/female, solar/lunar pairs in religion and mythology, such as Zeus and Athena, and Shamash and Astarte. The Alexandrian sect was apparently of a more philosophic character, and may have influenced Basilides through the teachings of Menander and Satornilos.